In blog, Jaitley says ‘half-document’ produced to undermine Rafale, says Rahul’s speeches on deal motivated by ‘personal hatred for the PM’. New Delhi: Finance and Corporate Affairs Minister Arun Jaitley, who returned to the country Saturday, after about three weeks of medical treatment in the US, has launched a scathing attack on the opposition, especially the Congress, for “spreading false information” about the Rafale deal. 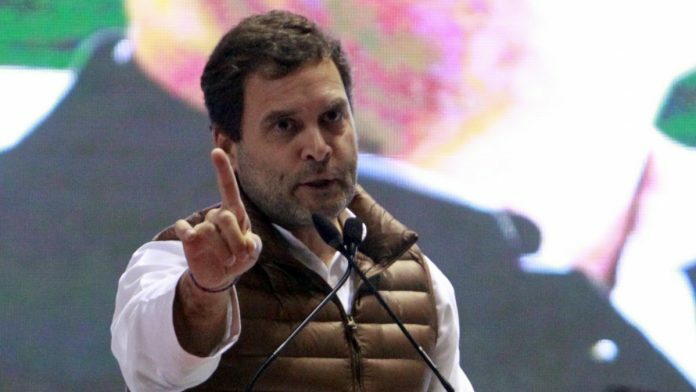 In a blog posted Sunday, Jaitley said Congress president Rahul Gandhi has singularly damaged India’s Parliament as an institution more than anyone else in recent history. Jaitley’s commentary on the judiciary, the CBI as well as the Election Commission is an attempt at explaining the ongoing controversies in the media in these areas. Sources meanwhile said Jaitley is likely to resume work around 15 February after the Parliament session. Jaitley has been “designated as minister without portfolio” till he resumes his work. The Rafale deal not only strengthens the combat ability of the Indian Air Force but saved thousands of crores for the exchequer. When its falsehood collapsed, a half document was produced to perpetuate the falsehood. Little did the creators of this falsehood realise that the cost of producing half a document is loss of full credibility. Those who organised loot on the banks between 2008-2014, started alleging that industrial loans had been waived. Not a single rupee was waived. On the contrary, the defaulters have been thrown out of management. The campaign against the GST fizzled out since in just 18 months of implementation it became a consumer friendly measure reducing taxes, exempting small businesses and ending corruption harassment by eliminating interface of the assesse and the officials. Illustratively little did the authors of the PMLAs harsh provisions realise that the provisions could haunt the authors themselves. It is, therefore, necessary to analyse this argument of “institutions under attack”. History will record that Pt. Jawaharlal Nehru’s great grandson has singularly damaged India’s Parliament as an institution more than anyone else. Attempts are made at 11.00 AM every morning by the Congress Party to disrupt both Houses. The Rajya Sabha once known for the quality of its debates has become non-functional. If we analyse Rahul Gandhi’s two speeches on Rafale, they are based on a personal hatred for the Prime Minister emanating from envy. A failed student always hates the class topper. Additionally, the context of the speeches points more to college-level lumpenisation in content. It has been left to two opposition members namely Bhartruhari Mahtab of the BJD and N.K. Premachandran of the RSP to fill up the intellectual vacuum that the Congress has created. One of the key points being made in regard to the judiciary is that the government referred back one of the recommendations to the Supreme Court to the collegium for reconsideration. The government under the present constitutional procedure, is entitled to refer back a recommendation of the collegium by recording reasons in writing. If after reconsideration the collegium re-recommends the case, the government implements the recommendation. This was done in the present case. Regarding delay in implementing the recommendations, the last five years have seen more appointments each year than done in any of the UPA years. The ill-advised press conference of four judges of the Supreme Court last year has more to do with intra-court affairs than with the government. On the contrary, what is the track record of the government’s opponents with regard to their attitude in relation to the judiciary? The impeachment motion filed by the Opposition on unsustainable grounds was only an attempt to intimidate the then Chief Justice of India and set an example for other judges — you toe our line or we can create an embarrassing situation for you. That was the loud and clear message. Lawyers opposed to the government have consistently used intimidation of judges as a court room tactic. Walk out of court hearings, to social media campaigns against the judges was unprecedented but today a reality. Using the instrument of falsehood they have preferred several petitions where facts have actually been found to be false inviting severe strictures from the court. The glaring examples in this regard are the falsehood with regard to Judge Loya’s death, the Rafale issue, the fake voter list scam in Madhya Pradesh and the Vyapam case. In each of the cases, the facts stated were found to be false. Notwithstanding the judgements of the court, many opposition leaders continue to still rely on the same falsehood. Adverse judgements have led to a campaign against the court. We witnessed a social media campaign against the judgement in the Judge Loya case. After the recent Rafale judgement, one of the petitioners (a former career nationalist) announced that the Supreme Court had lowered its credibility by deciding the Rafale case. The government has consistently maintained an arm’s length distance with the Election Commission. There have been no significant issues between the government and the commission. The attack on the EVM’s is not merely to allay defeat, it is an attack on the Election Commission. The EVM were introduced into the election process when BJP was nowhere close to power. Multiple parties have won and lost elections held through the EVM. Without producing a shred of evidence, the EVM’s are being attacked. The campaign became farcical when a fraudulent press conference was held by an invisible man through video in London claiming to have knowledge of the alleged 2014 rigging. The government and the BJP have consistently stood by our Armed Forces whether we were in government or in opposition. It is the Opposition which questioned first the existence of the surgical strike and then played it down as a routine action which has also taken place in the past. The Army Chief was described as a ‘Sadak ka Gunda’. Serious doubts have been raised on the Air Force led choice of the combat aircraft Rafale and its negotiation process. In the face of all this, they allege that institutions are under attack by the Government would be a mockery. Congress governments in the past have been liberal in asking Governors of the RBI to quit. Pt. Nehru, Mrs. Indira Gandhi and subsequently Mr. Yashwant Sinha had asked Governors to quit. During the UPA government, two governors were barely on speaking terms with the Finance Minister. Nothing of this kind has happened in the recent past. The government legitimately flags the issues relating to liquidity and credit availability with the RBI. They were raised at the highest level of the Government and through all processes – statutory and consultative. The issues were legitimate. The government is the principal manager of the nation’s economy. How can raising legitimate issues relating to credit and liquidity availability be an interference with the RBI. The Government consistently maintained communications with the RBI Governors during its tenure. The government does not interfere in any investigative function of CBI or any other investigative agency. Once the government received the recommendation of Central Vigilance Commission with regard to transferring two squabbling officers of CBI asking them to go on leave, the Government in the larger interest of restoring the credibility of the CBI acted. The government’s stand has been vindicated with regard to the cleansing of a key investigative agency when based on the CVC’s report, the three member High Powered Committee decided to recommend the transfer of the CBI Director. Restoring the credibility of an investigative agency is strengthening the institution and not assaulting it. In fact, it is the Opposition which has maintained a two-way approach to the CBI – on a daily basis the CBI should be attacked when it investigates corruption but if the Government takes action to restore the credibility of the CBI, the Government should be put in the dock. There are two critical features of these new emerging breed of ‘institution protectors’. They criticise the Government the maximum and simultaneously argue that free speech is in danger. They shed crocodile tears for democracy and make every effort to convert the world’s largest democracy into a dynastic one. The number of BJP-RSS workers killed in the Left Front ruled Kerala and the TMC Ruled West Bengal should shock the conscious of a nation. In West Bengal, democracy is seriously under peril. BJP leaders can’t land, public meetings are being prevented and the Rath Yatra was disallowed. The Congress party’s stand on multiple issues is self-contradictory. It slaughters a cow before the cameras in Kerala, and invokes the National Security Act against cow killers in Madhya Pradesh. More than any institution it is the country whose interest is paramount. These ‘institution protectors’ support the legitimising of illegal infiltrators into India. They readily jump to the support of those who want to dismember India. The Congress aligned with the Maoists in the recent Chhattisgarh elections. Rahul Gandhi stood shoulder to shoulder with the ‘Tukde Tukde’ gang at the Jawaharlal Nehru University. The Congress was in the forefront of defending the urban naxals in court. And yet it claims to be friend of both, the idea of India and its institutions. It is about time that India and its institutions are protected from these ‘institution wreckers’. Who has ever questioned the combat ability of Rafale or Eurofighter or Bofors? How has Rafale saved thousands of crores? When, whose falsehood collapsed, Mr Jaitley? 2) “History will record that Pt. Jawaharlal Nehru’s great grandson has singularly damaged India’s Parliament as an institution more than anyone else. Attempts are made by the entire opposition to disrupt both houses at 11 AM. Because Modi government does not agree to their demand of JPC on Rafale. If falsehoods are the emblem of Congress, and honesty of the BJP, then why don’t you allow JPC? just as the opposition demanded JPC on Bofors and the ruling party allowed it? Because government chooses a friendly election commissioner, so it knows things will be done according to its wishes anyway? I apologize I’m putting 2 and 2 together here, but it’s a fact that the present CEC Mr Arora was given an extension when he retired from his regular IAS position, and was then transferred to EC. But more tangible examples are available from the conduct of the previous CEC Mr AK Joti who was airlifted from Gujarat for the job. Mr Jaitley! So are you saying that these doubts are baseless?! That is the crux of the matter — if the “negotiation process” is above suspicion then why not constitute a JPC?! 6) Mr Jaitley says something about the RBI under previous governments, but all I know from reading newspapers is that NO previous government coaxed or cajoled or hinted to use Para 7 to delve into RBI’s reserves. Mr Jaitley also says something about this government never having interfered in the functioning of the CBI. People are laughing, Sir! Itna to chaiwala bhi chamacho ko nahi dhota!